A year ago Creme Brulee Guy was working as a carpenter, before hitting the streets. "The recession was really bad and we just needed some extra money and we also thought it was something fun to do but we didn't expect it to get as big as it is now." San Francisco’s gourmet food is getting some street cred. We’re not talking about its famous restaurants like Jardiniere or Aqua – we’re talking rolling carts dishing up everything from tamales, to gourmet Currie, to Asian-infused tacos. As the bleak economy puts the squeeze-hold on brick and mortar restaurants and the jobless, many are taking to the streets to sell their gourmet wares. "We're on Twitter. We're on Facebook," said Tan Tuong who operates Kung Fu Taco out of a taco truck in San Francisco financial district. "People tend to look for us on there." 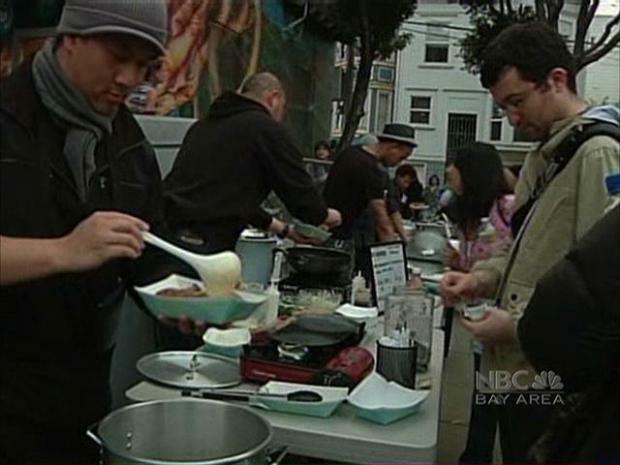 The growing popularity of the mobile food vendors has caught the attention of San Francisco city officials. On Monday, around 150 vendors turned out for a Board of Supervisors Neighborhood Committee on how to regulate the growing industry. "San Francisco is the food capitol of America," said supervisor Bevan Dufty. "But in terms of street food or mobile vending, many people tell us we’re really behind the times." Dufty says the city needs to review the permit process for street vendors. Currently, the police department is in charge of issuing permits for vendors who want to operate on public property. The regulations ban vendors from selling close to schools or restaurants that sell similar food. "I think some of these carts are offering more healthy choices than you’re finding in a school cafeteria," said Dufty who organized the hearing. "I think we need to look at whether these rules are outdated." Vendors speaking before the board complained the permit process is too lengthy, confusing and expensive. Permits to sell food on public property can cost up to ten thousand dollars. High end food carts are all the craze these days in San Francisco. Several years ago, Larry Bain opened a hot dog cart called Let’s Be Frank. His dogs are made with sustainably grown beef, with buns from Acme bakery. Bain said he applied to sell his dogs in San Francisco new Mint Plaza but was turned down by police because nearby businesses sold the same food. He described the process as vague and frustrating. "With an emerging entrepreneur who might have barriers around language or equipment or communications, the process is impossible," Bain said. Dufty said the city could simplify the process between multiple agencies like the Planning Department, the Health Department and Small Business Development. He said it could also create an outlet for the public and brick and mortar restaurants could lodge possible complaints.